Melting polar caps, rising sea levels, and intensifying wave-current action are responsible for unprecedented levels of coastal erosion. Concurrently, extreme natural phenomena, such as storms and hurricanes, have had severe impact on coastal areas. Throughout the country, the multiplication of coastal infrastructure projects in the aftermath of Hurricane Sandy sheds light on the urgent need for new and improved alternatives that protect vulnerable communities while preserving the environment. The present article will give an overview of shore management strategies in the U.S. and discuss the role of innovation in developing efficient, environmentally friendly coastal protection infrastructure. It will further present the R&D tax credit opportunity available for companies engaged in turning the tide on U.S. coastal vulnerability. According to Census data, about 39% of the U.S. population, or 123 million people, now lives in shoreline counties. 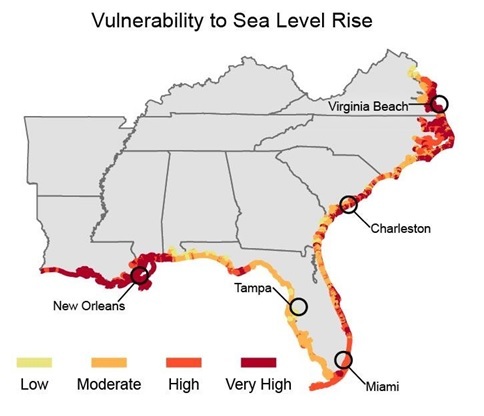 This demographic concentration exacerbates the country's vulnerability to the effects of sea level rising.Released in May 2014, the federal government's third National Climate Assessment highlighted the impact of climate change on U.S. coastal areas, as depicted in the following image. In addition to sea level rising, extreme natural phenomena also put coastal areas at risk. Almost two years after Hurricane Sandy decimated the northeastern coastline, damaging houses and infrastructure, debate is still underway to determine best practices in preventing similar tragedies. Sandy had major effects on coastal erosion. Experts point out that some locations lost as much cubic yards of sand as they usually do in an entire decade. According to the American Littoral Society, 94 percent of beaches and dunes in New Jersey were damaged, with 14 percent suffering a major loss of dune vegetation and beach erosion of 100 feet or more; and 43 percent being moderately affected, losing 50 to 100 feet of beach. The beach from Bay Head that extends north to Sandy Hook dropped six to eight feet vertically and eroded landward 100 to 150 feet horizontally. In New York Harbor, Raritan Bay, and Jamaica Bay, a quarter of the beaches and dunes lost 50 to 100 feet of beach to erosion; on Long Island Sound, about 28 percent faced similar damage. Coastal damage and erosion, however,are not restricted to the northeast. Nearly nine years after Hurricane Katrina devastated south Louisiana and Mississippi, the long-term stability of the Gulf Coast remains a cause of concern both due to natural and man-made threats. During the past eight decades, Louisiana lost 1,880 square miles of coastal marshes, or an area about the size of Manhattan every year. According to the non-profit coastal advocacy group Restore or Retreat, if current land loss rates are not reversed, nearly 640,000 acres, or an area nearly the size of Rhode Island, will be under water by 2050. The potential magnitude of Louisiana's land loss disaster is depicted in the image below. I. 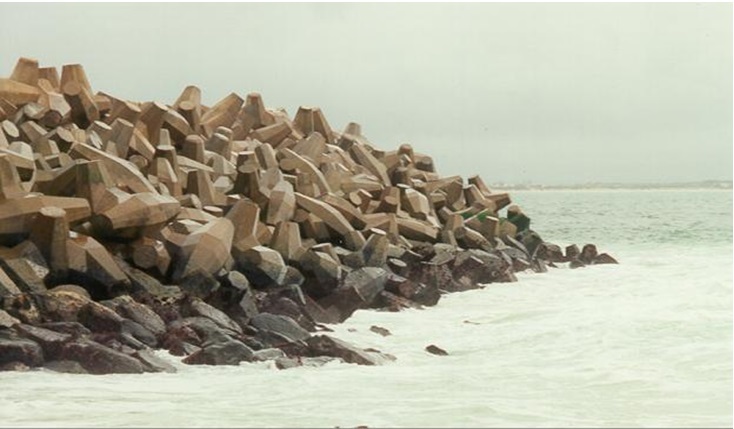 Structural Methods - which include seawalls, bulkheads, revetments, dikes and levees, breakwaters, sills and perched beaches, groins, jetties, and piers. II. Non-Structural Methods - such as vegetation planting, groundwater drainage, beach nourishment, sand bypassing, and flood proofing. Though many of these techniques have been around for years, innovation has played a crucial role in enhancing efficiency of coastline protection. Research efforts have focused on perfecting existing technologies, creating new ones, and developing modeling and analytics solutions for increased reliability. The CHLitself has carried out important research efforts aimed at perfecting the use of concrete armoring units, known as CORE-LOC, by giving them superior stability, structural robustness, and durability, and developing CORE-LOC modeling and testing applications. Below is an example of a CORE-LOC structure. 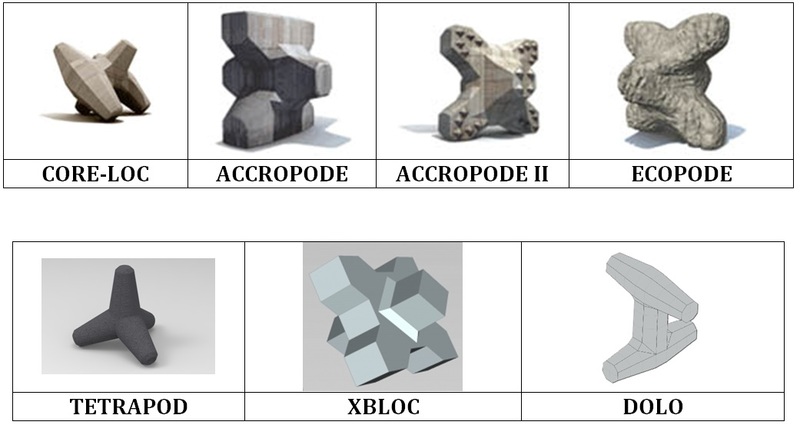 Besides CORE-LOC, a number of armoring solutions have been designed to meet the needs of different sites, as portrayed in illustrations below. The CHL is also engaged in developing innovative coastal storm modeling systems. Their objective is to provide a robust, standardized method to accurately assess the risk of coastal communities. With physics-based modeling capabilities, the Coastal Storm Modeling System (CSTORM-MS)integrates a suite of high fidelity storm modeling tools to support a wide range of coastal engineering needs for simulating storms; wind, wave, and water levels; and coastal responses, such as erosion, breaching, and accretion. Also created by the U.S. Army Corps of Engineers, the Beach-fx is a comprehensive and innovative modeling tool and analytical framework for evaluating the physical performance, economic benefits, and costs of shore protection projects.Through an event-driven Geographic Information System (GIS) framework and a database of plausible storms, the software evaluates shoreline changes and economic consequences, tracks individual damage drivers (e.g.inundation, wave-attack, or erosion) to allow for evaluation of alternative plans and responses, and predicts the costs of shore protection alternatives. The private sector is also engaged in coastal protection innovation. Based in Appleton, WI, Presto Geosystems developed the Geoweb system for soil stabilization. The geocell cellular confinement system consists of a 3D confinement structure that reinforces the upper soil layer, providing resistance to erosive conditions and sliding forces. A very flexible solution, the Geoweb can be designed to provide long-term stability with sustainable vegetation, permeable aggregate, or hard-armored concrete. A growing number of companies are also investing in sustainable solutions for coastal protection. Australian infrastructure and environmental services companyCardnois the creator of the Dolotimber technology, a combination of dolo armoring units and wood that simulates the effects of natural woody debris. Dolotimbers are self-setting units that require very little excavation and can be used in bank protection and habitat enhancement projects. They are specially suited for environmentally sensitive areas, where conventional methods of construction are not ideal. 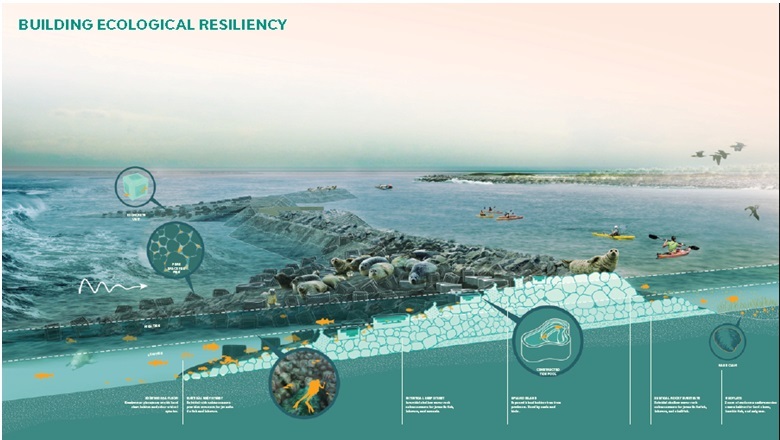 Throughout the U.S., the multiplication of shoreline protection projects shed light on recent trends and outstanding challenges to efficient and sustainable coastal infrastructure. The following sections will present an overview of ongoing efforts in the states of New York, New Jersey, and Louisiana. On June 2nd, the federal government announced plans to spend nearly a billion dollars in an effort to guard New York and New Jersey against future storms. Projects include the construction of earthen levees, water pump systems, and partially submerged barriers that will double as marine habitat. Among the most densely populated coastal areas in the country, New York has proven ill-prepared to resist natural disasters. With the objective of reversing this vulnerability, the U.S. Department of Housing and Urban Development and the Presidential Hurricane Sandy Rebuilding Task Force promoted a federal competition called Rebuild by Design. The initiative aimed to foster innovative solutions for creating a more resilient community. Winning proposals should begin taking shape in the near future and could bring important changes to NYC and surrounding areas. In the words of mayor Bill de Blasio, "I think you're going to see over four or five years a hugely different physical reality in this city". $355 million of the competition's funding will go toward building a portion of the first phase of a 10-mile protective barrier on Manhattan's East Side. This first element is part of a much larger vision conceived by Danish architecture firm BjarkeIngels Group (BIG), which aims to shield lower Manhattan with flood-protection zones that will also serve as recreation sites. 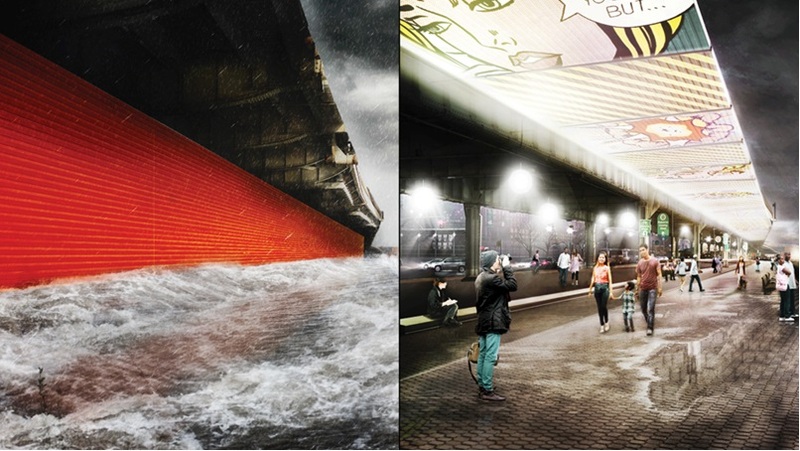 In the ambitious BIG U project, Manhattan's Lower East Side would see the multiplication of raised green spaces denominated "bridge berms", while the area between Manhattan Bridge Montgomery Street would be equipped with deployable walls attached to the underside of the FDR Drive, ready to flip down to prepare for flood events. The entire first phase of this complex project would cost around $1.2 billion. Another winning project, which will receive $60 million in funding, proposed the construction of living breakwaters off the south shore of Staten Island. The partly submersed barriers will reduce the impact of storms and create new habitat for marine life, serving, for instance, as oyster beds. This living infrastructure is an interesting example of how innovation can combine storm protection and environmental benefits. In addition to reviving ecologies, the project aims to involve communities by connecting educators to the shoreline, and encouraging water-based activities. Living with the Bay, a comprehensive regional resiliency plan for Nassau County's South Shore, is yet another winning Rebuild by Design project. Considering the multiple water-based threats that face Long Island, the plan acknowledges that there are no "silver bullet" solutions to coastal protection and proposes a range of integrated adaptive measures to build a "buffered bay". One of such solutions is the construction of protection infrastructure called "smart barriers", which would serve as landscape amenities, providing access to bay-shore, and storm water landscapes, where storm water could be stored, cleaned, and replenished. Another solution is the construction of new marsh islands, designed to reduce wave action, improve ecology, and promote new recreational activities. Beyond the context of the federal design competition, Long Island is deeply engaged in overcoming its vulnerability to natural phenomena. As announced on May 21st, the region should receive at least $400 million in federal storm-recovery funding to finance wastewater projects aimed at reducing harmful nitrogen levels in waterways. Nassau County's nitrogen-removal system for the Bay Park Sewage Treatment Plant is among the projects to receive funding. Nitrogen in the effluent, which discharges into Reynolds Channel, weakens marshes that are crucial in protecting coastal communities from wave action and flooding. With a 127-mile coastline along the Atlantic Ocean and 83 miles of shoreline along the Raritan and Delaware Bays, New Jersey enjoys a combination of ecological riches and economic opportunity. On the one hand, the state's robust tourism industry is worth over $16 billion annually. On the other hand, New Jersey is home to over 1.5 million migratory shorebirds. Located in the potential path of hurricanes, tropical storms, and nor'easters, New Jersey depends on healthy beaches to act as buffers and provide mitigation from natural disasters. For this reason, the Bureau of Coastal Engineering, in cooperation with the U.S. Army Corps of Engineers, has developeda number of beach nourishment and re-nourishment projects that consist in placing sand along areas that have undergone erosion. In addition to beach nourishment efforts, the Bureau constructs and maintains shore protection structures including jetties, groins, seawalls, breakwaters, and bulkheads designed to protect the coastline and navigable channels of New Jersey. Recent projects have aimed at increasing groin permeability, as a means of providing shoreline stabilization and limiting diffusive losses in beach nourishment projects. The Bureau utilizes innovative methods to enhance the permeability of new and existing groins, such as lowering offshore crest elevations, notching and/or shortening groins, and increasing material porosity to allow a finite amount of sediment to pass over or through the groin. On July 10th, two New Jersey shore towns, Mantoloking and Brick Township, began a shore protection project that illustrates both the needs and challenges of coastal communities. Among the hardest hit by Superstorm Sandy, almost two years ago, the towns are building a 4-mile-long steel wall to serve as protection from natural disasters. The structure will consist of 45-foot-long steel sheets driven 30 feet into the ground and eventually covered by sand, which will form a dune system 22 feet above sea level. The U.S. Army Corps of Engineers will soon begin a beach replenishment project to widen the beach in front of the wall to 300 feet. The $23.8 million project has been criticized by environmentalists, which sustain that it will actually make things worse by accelerating erosion. According to Louisiana's Coastal Protection and Restoration Authority (CPRA), nearly two million people live in America's Wetland, many of whom in proximity to Louisiana's coast. In these areas, climate change and sea level rise exacerbate the threat of storms and hurricanes asthe loss of barrier islands and wetlands enhance vulnerability. Louisiana's ongoing coastal crisis directly affects its ports, which carry 20 percent of all U.S. waterborne commerce, provide 26 percent (by weight) of commercial fisheries landings, and supply 18 percent of the nation's oil. In addition to their economic importance, Louisiana's wetlands provide winter habitat for more than five million migratory waterfowl and offer stopover habitat for millions of neotropical migratory birds. Restoration Projects, which include bank stabilization, barrier island/headland restoration, channel realignment or diversion, hydrologic restoration, marsh creation, oyster reef engineering, ridge restoration, and shoreline protection. One example is the protection project in the East Orleans Landbridge, a thin strip of land that separates Lake Pontchartrain and Lake Borgne east of New Orleans. It consists of placing thousands of aggregate-filled Geogrid Marine Mattresses as revetment along the 8.7-mile shoreline. The project will use 217,000 tons of recycled concretefrom the dismantled 1-10 twin span bridges.It is expected to prevent the loss of 110 acres of marsh and minimize shoreline retreat. Protection Projects, such as concrete walls, earthen levees, floodgates, hurricane protection, and pumps. The Larose to Golden Meadow flood protection project, for instance, addresses enhancements to a 48-mile ring levee encompassing a stretch of Bayou Lafourche and the surrounding area from the Gulf Intracoastal Waterway south to below Golden Meadow in Lafourche Parish. The initiative is considered vital to protecting 27,000 people living inside the ring levee and to guaranteeing the good functioning of Port Fourchon, one of the country's most important ports for offshore and imported gas and oil. Resiliency Projects, including elevation of residential structures, residential and commercial floodproofing, and the voluntary acquisition of residential structures located in areas where the projected flood depths make elevation and floodproofing infeasible. Since 2007, Louisiana's CPRA built or improved over 159 miles of levees, benefitted over 19,500 acres of coastal habitat, and secured approximately $17 billion in state and federal funding for protection and restoration projects.During Fiscal Year 2014, over 50 projects will begin or continue construction, including 18 protection projects, 37 restoration projects, and two infrastructure projects. Such efforts represent a total state investment of nearly $540 million in FY 2014. When it comes to private initiatives, Louisiana has experienced a multiplication of voluntary efforts. The Coalition to Restore Coastal Louisiana, for instance, has undertaken two restoration projects on Grand Isle, located two and a half hours south of New Orleans, and its neighbor to the west, Grand Terre. More than 325 volunteers have worked on the restoration of 25 acres of dune habitat on these important barrier islands. The initiative consisted of installing over a mile of sand fencing and planting 29,000 stalks which help stabilizing existing sand and serve as barriers to capture additional sand, form sand dunes, and preserve the islands. Recent events have shed light on America's coastal vulnerability. This susceptibility to the effects of climate change and extreme natural phenomena threatens not only a significant share of the population but also the ecosystems and economic activities that depend on shoreline conditions. Innovation has a major role to play in turning the tide on coastal erosion. In New York, New Jersey, and Louisiana, innovative efforts have managed to build more resilient communities through efficient and sustainable infrastructure. Federal R&D tax credits are available to assist companies engaged in developing new and improved solutions to protect America's coastal areas.